In today’s tutorial we will show you, how to install Virtual Environment on Ubuntu 16.04. We may face issues when our Linux distribution only offers certain versions of Python and its packages, when we actually need newer versions. We can install new versions of Python on the server, of course, but this will be more complex because we will have some dependency issues when trying to compile everything we need. Virtual environment make this very easy to manage and set up, we can have different versions of Python in each environment, and it will be isolated from the main system. Installing Virtual Environment on Ubuntu 16.04 is fairly easy task and it shouldn’t take more then 10 minutes to finish. “rose” is the name of the virtual environment. We can see some sub directories inside “rose”. We will want to focus on the bin directory. The bin directory contains local copy of python binary and the pip installer. As you can see, we don’t use sudo, because we install it on a virtual environment, not server wide. Of course, you don’t have to install and configure virtual environment on Ubuntu 16.04, if you use one of our Linux VPS Hosting services, in which case you can simply ask our expert Linux admins to install and configure virtual environment on Ubuntu 16.04 for you. They are available 24×7 and will take care of your request immediately. PS. 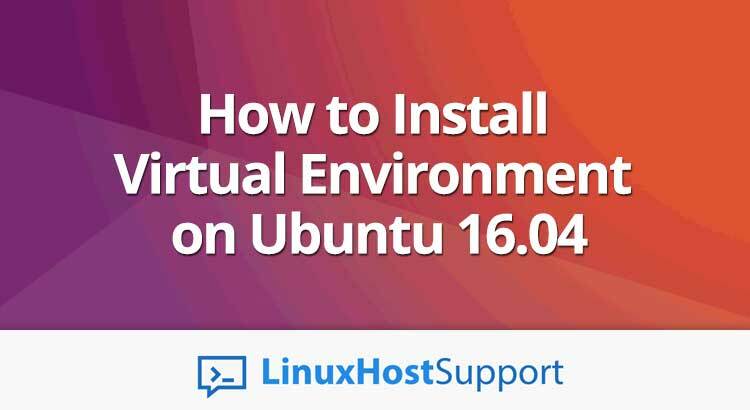 If you liked this post on how to install virtual environment on Ubuntu 16.04, please share it with your friends on the social networks using the buttons on the left or simply leave a reply below. Thanks.